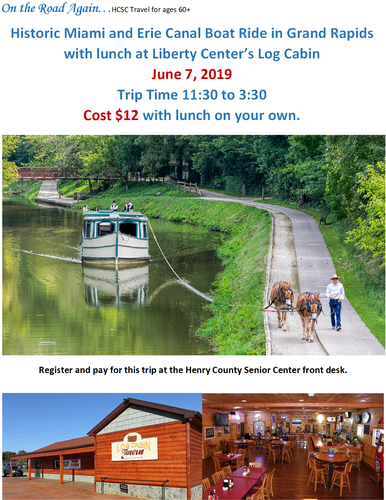 On the Road Again...HCSC Travel, for anyone ages 60+, is going on a Historic Miami & Erie Canal Boat Ride in Grand Rapids and to the Log Cabin in Liberty Center for lunch. Cost is $12 with lunch on your own. Register and pay at the Henry County Senior Center. Bus will load at the Henry County Senior Center at 11:30. Friday June 7, 2019 Trip time 11:30 - 3:30. Register at HCSC 419-599-5515 or with Jan 419-337-5101. Cost $12 with lunch on your own.